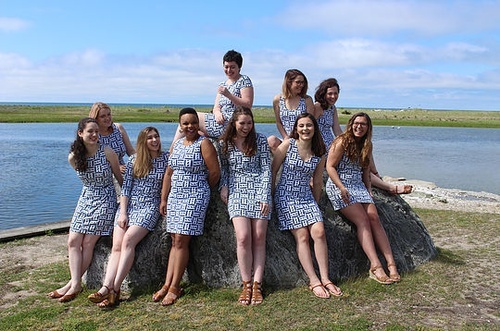 Cape Harmony is comprised of 10 talented young women from all over the nation who come to Cape Cod during the summer to make music for its residents and visitors. The group is entirely self-run by it’s current members. Founded in 2006, Cape Harmony has become a dynamic group with a unique sound and superb quality. Cape Harmony has been featured on radio stations and on television, as well as in numerous newspapers. Now in its 12th year, Cape Harmony continues to bring our refreshing and high quality music to audiences of all ages. Cape Harmony has performed in destinations all over Cape Cod including but not limited to, Hyannis, Dennis, Chatham, Provincetown, Sandwich, Cotuit and Barnstable. Presently our weekly concert series is hosted at the Federated Church of Hyannis, St. Christopher’s Church in Chatham, the Federated Church of Cotuit, and the First Congregational Church in Falmouth.